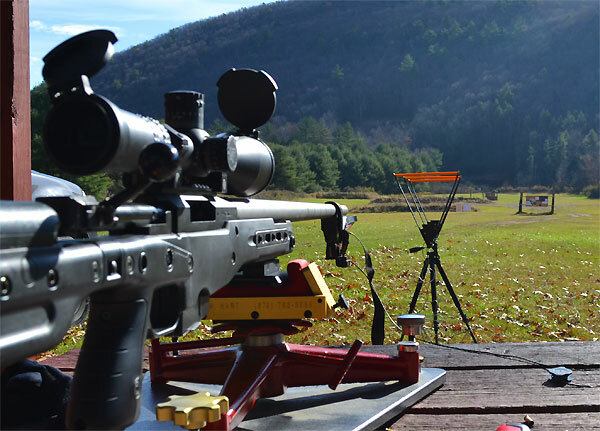 The 6.5×47 brass from Lapua is as good as it gets and is a very efficient case. The small primer pocket has been a proven winner so no need to change anything. This combination has always given reliable precision and extremely tight velocity spreads. 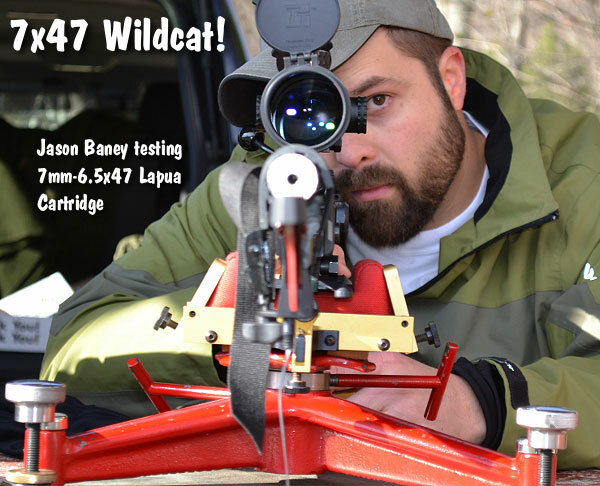 So here I was, ready to expand a 6.5×47 Lapua to 7mm but a web search revealed no info on a 7×47 wildcat, so test loads would be based purely on an educated guess. My initial assessment/prediction was that heavier 180gr bullets in the larger 7mm caliber would end up at a max load very close to a 140gr bullet in the parent 6.5 caliber. This actually turned out to be a very accurate assumption. The performance goal of this cartridge was to get a 180gr Berger Hybrid moving at 2720 FPS or faster to be able to shoot inside of a 6.5mm 140gr Berger Hybrid at 2900 FPS. (That 2900 speed is what I was able to achieve with the standard 6.5×47 Lapua). I also planned to try the 168gr VLD as well as the 180gr Lapua Scenar and 162gr Amax, but the specific goal was the beat the 6.5 140gr bullets at 2900 FPS. I believed the 180 Hybrid at 2720 FPS would be the easiest way to accomplish this. 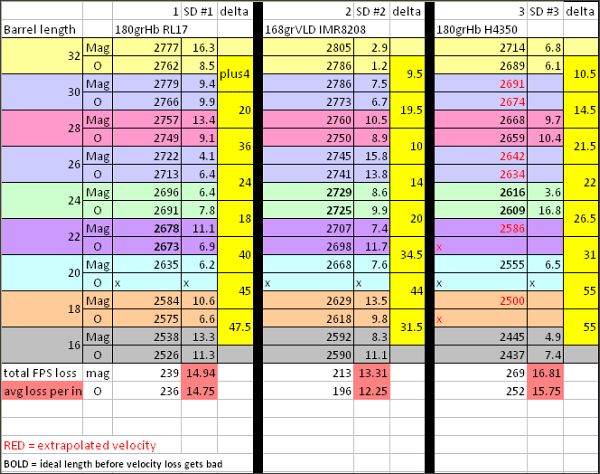 Here are Summary Test Results for H4350 and Reloder 17 for 180s, and IMR 8208 for the 168s. Speeds were clocked by two chronographs at nine (9) barrel lengths, 32″ to 16.1″. Since this cartridge was a complete unknown I thought it would be quite interesting to see what the 7×47 could achieve at various barrel lengths from very long to very short. We wanted to see which length would best suit the bullet/cartridge combination for max performance. Obviously testing 8-10 barrels at different lengths would be pointless due to natural performance variations between barrels, not to mention expensive and wasteful. I decided instead to attempt a fairly radical test and cut a barrel from 32″ down the 16.1” while chronographing the same loads along the way to see what each combination delivered at the different lengths. Before I could get started of course a reamer and dies and a few other parts were needed. Dave Kiff at Pacific Tool and Gauge was excited to get going on the project so soon after our phone conversation my one of a kind reamer arrived. Since I had been using Forster dies in the 6mmx47 Lapua and 6.5×47 for all these years, I contacted my friend Bob Ruch at Forster and he was willing to make me a few sets of special dies for the project. Lapua of course provided some brass for the project and Rock Creek Barrels sent a beautiful 1:8.7″-twist 5R barrel blank as a sacrificial lamb. The gunsmith I chose for the chamber job on this project needed to be a tactical long range rifle shooter to appreciate the capability of the round all the way down to its 16.1” barrel length so I asked my good friend Wade Stuteville from Stuteville Precision to help me out. The rifle I selected for the test was Accuracy International’s new AT rifle. This rifle is basically an overhauled and updated AI AW with a quick user-changeable barrel. I can literally change a barrel in 1 minute or less. The machining they have done to give this function was quite simple and brilliant in the way it retains the barrel yet allows the release quickly and with only a 4mm allen wrench. This would make the test that I contrived go very smoothly as no major tools were needed. My goal was to use as many different load combos for the test as I could without making it extremely cumbersome to complete. I wanted to test at least the 180 and 168 Berger as well as a couple different powders representing different burn rates to get an all-around feel for how the cartridge would behave at the different lengths. From previous experience with the 6.5×47, the best powder choices were Hodgdon H4350 and Alliant Reloder 17 (RL17) so these would be the main players. I also picked IMR 8208, Varget, and VV N550 to cover the spectrum of acceptable burn rates. Also, my standard CCI 450 primer was used as that has been successful for me in the 6mmBR and 6.5×47 since 2006 as they are incredibly consistent, however they are also better able to take high pressures without blanking. After picking the powders, I first ran ladder tests to assess max loads in the long 32” barrel. Laying out the test actually took a bit of bit of mental gymnastics to provide randomness. The barrel was to be cut in 2” increments from 32” down to a final of 16.1”. Each length was actually pre-scored by Wade to make cutting easier to start and was actually 1/8” long at each mark so when I finally ended up at 16 1/8”, I was able to have the barrel re-crowned without going below legal length. Six loads were assembled using the five powders mentioned above and two bullets (Berger 168gr VLD and 180gr Hybrid). Each set of rounds to be fired at each cut was predetermined and laid out so that the same load never preceded nor followed another more than once. Reloder 17 and H4350 loads were fired at each cut, while the four others were fired at every-other cut to keep the round count under 200. Twenty rounds (4 loads times 5 rounds each) were fired at each cut from 32” down to 18” and at the final 16.1” length each of the six loads was fired. That is a total of 190 test rounds. The barrel was cleaned before firing at the 24” length and before firing at the 16.1” length. After cleaning each time I fired two rounds of the next load as fouling shots to normalize velocities. After every round of firing, the barrel was removed and we poured cold water on the exterior only and wrapped a wet towel around it to speed cooling. 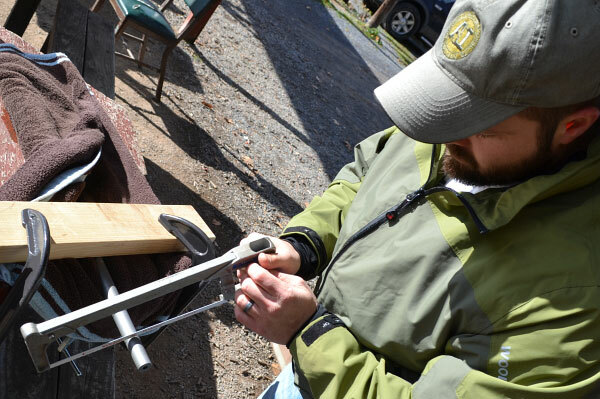 While the barrel was cooling we used a couple C-clamps and a 2×4 to create an impromptu barrel vice to hold it while we were cutting. While it was clamped, we used a simple hacksaw to cut off two inches and crowned the barrel with an RCBS deburring tool for a nice finish. It took an average of two minutes to cut through the barrel at each length. 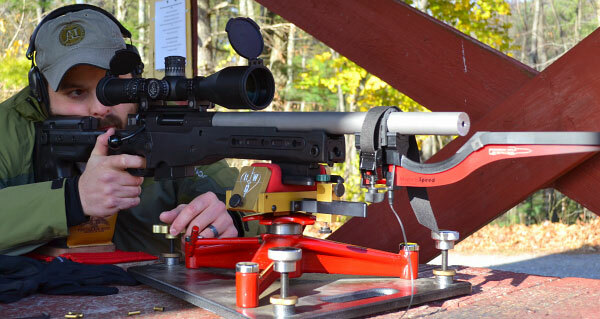 Throughout the test, the rifle lost 3.2 lbs on its way to 16.1 inches. The recoil and muzzle blast increased dramatically from 32″ down to 16.1″. Groups on target were actually quite impressive given that we were not really trying for absolute precision and we had rough-cut crowns. Many groups formed one large hole and several were half-MOA or better – even at the final 16.1″ length. Each load lost between 12.25-16.8 FPS per inch (loss per inch – LPI) over the entire test, though the rate of the loss varied by the burn rate of the powder and by barrel length. Generally below the 24” barrel length the LPI accelerated rapidly. Initial LPI at the longest lengths was 0-10 FPS, while the loss per inch at the shortest lengths were much higher at 30-55 FPS! In general I did not quite achieve the velocity I was hoping for, but am very close and intend to test longer throats and different throat geometry to get where I want to be. Below I will break the attainable performance down into 3 barrel lengths for consideration in different disciplines. Since I am close to or past my target velocity at the longer lengths (above 2720 FPS with the 180gr Berger Hybrid), I intend to barrel a 1000-yard Benchrest rifle in this caliber and give it an honest try in 1K benchrest. I feel that, with a 28-30″ barrel length, my goal will be attainable and it will pull away from 6.5mm class rounds in the wind drift department. While there will be a slight recoil increase, in a 17-lb rifle it is not a concern. There will also surely be a significant gain in useful barrel life as well. For tactical matches, I hoped to achieve good results with a 22-24″ barrel length, but it appears it may be difficult to attain the velocities needed. I have a lot of velocity to make up here to beat the 6.5 round, but will give it a go utilizing a longer throat to gain the velocity. The longer throat in this case will make the round longer than the Remington 700 internal box, but not too long to function in Accuracy International’s AICS and AW-type magazines commonly used in this discipline. Running with a short barrel and suppressor may prove to be what the 7×47 does best. Most 16″ sniper rifles are built around the .308 Win round. 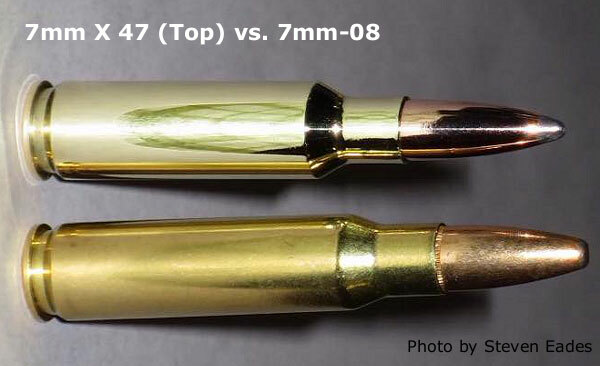 In terms of ballistics, The 7×47, even with its current performance, represents a significant gain over a .308 Win in a 16” barrel. The 180gr Hybrid at 2500 FPS shoots well inside a 175gr .30-caliber bullet at the same velocity. Compared to other non-magnum rounds fired in a 16″ barrel, the 7×47 appears very promising (and it beats the .308 Win for wind drift). All in all, the test was fun, educational, and a moderate success. I am excited to test this round further to see what is possible and will continue to report on it as results follow. The 6.5×47 Lapua has always benefited from small diameter and tightly fitted firing pins for best performance. This is not something you expect from a real-deal LE/Mil sniper rifle though due to reliability concerns. I decided to give the rifle a chance though with the bolt unaltered. However, the results (blanked primers) were immediate and dramatic. Every single load in the initial pressure test blanked primers 10% short of the intended velocity goal. This was not encouraging. The original pin measured about 0.080” while the hole it traveled thru was about 0.084”. While this was not really an over-sized hole, the large pin proved very abusive to the small primers. This bolt and pin modification immediately solved the issue and I have not blanked a single primer since it was modified. After max safe loads were found, I came down a bit for the test loads to make sure I had no issues all the way thru. At this point group sizes were not assessed at all, simply pressure signs.